The Palestine Cemetery: If we need a reminder of the swift passage of time. Why is the change of one year to the next cause for celebrations and parties and noise? I think it’s because all that merrymaking is supposed to mask the sadness we are otherwise likely to feel at the passage of yet another year. Somebody said that the passage of time is nature’s way of making sure that everything doesn’t happen all at once. But when you look back, it seems that everything still happened pretty damn close together. You were hardly out of school when you had a family and a house, and right away your kids were grown and gone and your work was already over and now you find yourself in a year that you never thought about, much less expected to see. In this part of the world the sun came out on the last afternoon of 2013, and it was a good time to look around. 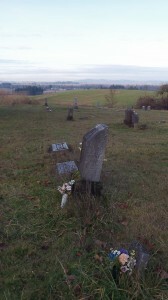 There’s a cemetery not far from where we live. Lilla Barnes rests there. She was born in 1893 and died on Jan. 15, 1899, just after her sixth birthday. Good Fortune is retrospective. Hope. Now there is something to contemplate. Happy New Year. Happy New Year! Thanks for putting all the time and effort into this great blog. Happy New Year and thanks for the blogs. You are a voice of reason in a world of cacophony! Happy New Year! Thanks for your blogs. You are a constant voice of reason!